The dish was made by Egermann, famous Novy Bor Glassworks, shaped by hands using wooden and iron tools directly at the furnace. A glamorous Bohemian heavy crystal free blown massive heavy glass with beautifully ruby flashed distinctive color. 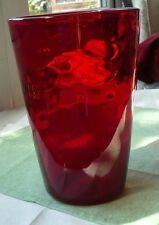 Original Whitefriars red glass vase. Excellent condition. A beautiful Ruby Red and clear glass 'Bark Texture' Vase designed. Circa: 1950's - 1960's - polished pontil mark. A LOVELY LATE VICTORIAN SPARROW BEAK CREAM JUG, WITH CLEAR GLASS STRAP HANDLE. LARGE RUBY WRYTHENGLASS VASE WHITEFRIARS 8"high, base 4"
Fabulous lidded jar probably late 19th Century. Beautifully hand painted. One photo has a tissue inside so you can see the hand painted design detail. Antique c 1880 Bohemian ruby flashed glass vases dating from around 1880. Here we have a lovely pair of glass vases made in the the then Bohemia around the latter part of the 19th century. They have been hand blown and have rough pontils on the base. LOVELY PROPORTION, FORM AND RUBY RED IN COLOUR. THOUGHT TO BE BOHEMIAN, CZECH OR FRENCH. SIGN OF USE ON THE BASE. ANY GILT DECORATION IS WORN AWAY. ORIGINAL STOPPER AND BOTTLE, BOTH HAND NUMBERED ' 27 ', PONTIL MARK. Details & photo's to follow. Art Glass Vases. 2 x Victorian / early 20th c.
HEAVY ORIGINAL ANTIQUE BOHEMIAN RUBY GLASS PEDESTAL GOBLET VASE, ENGRAVD, EXCL. 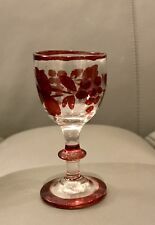 A beautiful heavy and tall original BOHEMIAN antique ruby cut glass pedestal beaker cup. PEDESTAL GOBLET. The goblet is c. 6.30 in (16 cm) tall and c. 3.35 in (8.5 cm) wide at the top. ORIGINAL BOHEMIAN. Venetian Murano deep ruby red glass bowl. 3 curly clear glass feet. Vintage Murano Ruby Red Sommerso Glass Basket Dish. This is quite a heavy piece of glass for its size. Will be well packed with plenty of bubble wrap. I’m having a bit of a spring clean and clear out so please have a look at my other listings. Will be posted via Royal Mail signed for 2nd Class. I will send the tracking information as soon as ive posted. Will only post via Royal Mail Signed for so that it doesnt go missing and it can be tracked. No Returns. The Purple Panther. Don't Miss Out.